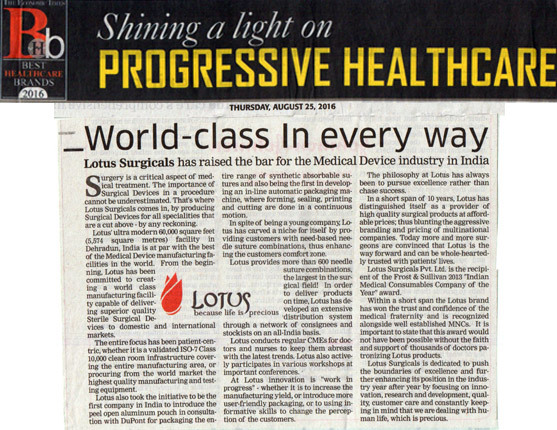 Mumbai, India, 1 st October, 2013 – Lotus Surgicals Pvt. 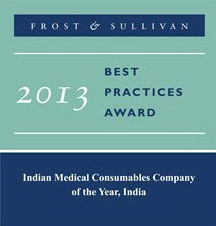 Ltd. has been honoured with the Frost & Sullivan 2013 “Indian Medical consumables Company of the Year” award. The award was received by Mr. Mehernosh Daruwalla, Managing Director, Lotus Surgicals Pvt. Ltd. at the recently concluded 5th Annual India Healthcare Excellence Awards banquet at The Lalit Hotel, Mumbai on 27th September. This Award is conferred to a manufacturer based on a structured research process and evaluates various aspects of the company such as revenue and market share growth, geographical and product line expansion, visibility of the company, value‐added services, strategic and technological innovation, and clinical excellence. Lotus has been recognised for its outstanding performance in 2013 with respect to the above criteria. 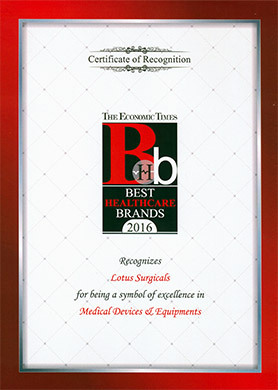 Congratulating Lotus on the award, Mr. Jayant Singh, Associate Director, Pharma and Medical Technology, Healthcare Practice, Frost & Sullivan said, "A customer base of more than 2,500 hospitals and nursing homes across India along with best‐in‐class manufacturing facility has enabled Lotus to serve the varying needs of Indian customers. Focus on quality and excellent sales and distribution network has resulted in a 75 percent annual growth for the company." Lotus has invested in one of the finest ultra modern 60,000 square feet facility in Dehradun, India, which is at par with the best in the world. Its entire manufacturing area is designed to meet Class 10,000 cleanliness standards of US FED 209E (i.e. not more than 10,000 particles of size 0.5microns per cubic feet of air). Lotus sutures which form a major component of the business are used in supra majorsurgeries like by‐pass, heart valve replacement, paediatric cardiac surgery and liver and kidney transplants. Lotus was the first company in India to introduce a peelable aluminium pouch for synthetic absorbable sutures and also developed a fully automatic packaging machine where forming, sealing, printing and cutting are done in a continuous motion thus eliminating human error and handling. In a short span of six years, Lotus brand has been able to win the trust and confidence of the medical fraternity and is recognised alongside well established MNC players.